Parker Has Taught at Gettysburg for Over a Fourth of the College’s History. This Year, He Retires. | The Gettysburgian. Home » Features » Parker Has Taught at Gettysburg for Over a Fourth of the College’s History. This Year, He Retires. Parker Has Taught at Gettysburg for Over a Fourth of the College’s History. This Year, He Retires. The year was 1967. Thurgood Marshall became the first African-American Supreme Court Justice, Will Ferrell was born, the Beatles released Sgt. Pepper’s Lonely Hearts Club Band, and a young Dr. William Parker joined the chemistry faculty at Gettysburg College. Parker then clarified that while hours may be flexible and he could stay home with a sick child if needed, professors work much longer than 40 hours a week in classrooms, labs, grading papers and helping students. Parker has taught at Gettysburg College for 51 years. This equates to over a quarter of the college’s history! In 51 years, things have changed. For a start, the chemistry department was once housed in Breidenbaugh Hall and would be until the fall of 2002. Parker actually helped design many features of the Science Center along with Emeritus Professor Joseph Grzybowski and Professor Donald Jameson. Parker was also instrumental in initiating the Biochemistry and Molecular Biology program. He co-wrote the grant application to Howard Hughes with Emeritus Professor of Biology Ralph Sorensen that jumpstarted the program and was happy to see the chemistry and biology departments coming under the same roof with the construction of the Science Center. Parker said that the students have also changed over the years. “Students are better prepared. This is going to fly in the face of cynics, but we’re getting better students,” he commented adding, “not that they all work as hard as they should, but they are more capable.” He suspects that this is probably a reflection of Gettysburg’s increased selectivity; however, he notes that while students may be more capable, they are also busier and more involved than ever and marvels at how some students try to balance sports, musical ensembles, and courses, especially students who take multiple labs. While he has not been an active researcher in recent years, Parker has been an extraordinarily active educator. Parker has taught courses across the department, even designing an interdisciplinary course on symmetry. His favorite courses to teach are the general chemistry sequence. In a given semester he has taught between 70 and 170 students. Meeting a diverse group of students is what he enjoys most about teaching. 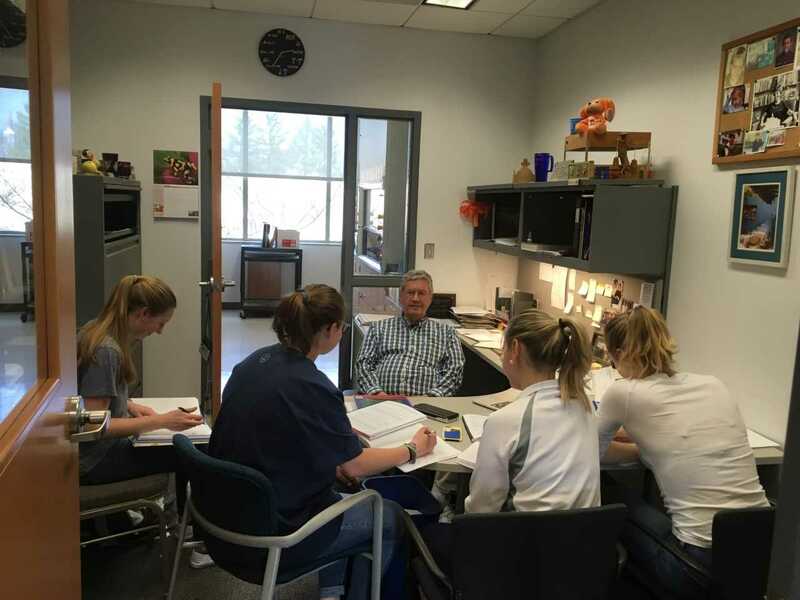 On the average weekday, the popular professor is surrounded by a flock of general chemistry students in need of help with their homework and lab work. He enjoys office hours and informal question and answer sessions with students more than lecturing in the classroom. “I mean we all love him,” claimed Matthew Coe ‘21 to the agreement of a crowd of students gathered in the chemistry lounge. What is the key to staying sane teaching for 51 years? According to Parker: “Patience. I’m a pretty patient person.” While some students have tried his patience, Parker admitted that sometimes he and students have too much fun and get distracted from chemistry. Parker reflected that students helped him as much as he helped them after the death of his wife Frances Parker. The Parkers were married for 46 years when Frances died, and many current students will recall Professor Parker taking leave in the spring of 2016 when she passed. Most people enrolled in Chemistry 108 will also remember that he did not leave for long – taking solace working with students and continuing as he had for 49 years to be a resource and mentor to students. Parker said that he will miss teaching and mentioned possibly leading review sessions for general chemistry exams even after retirement. We can only hope that Gettysburg College would rehire such an inspiration. I had Dr Parker in 1977. He was a good teacher and good man. His class was a part of my journey towards dentistry. I am grateful for his fine tutelage!